"My Auntie Brenda celebrated her 80th birthday on 6th March 2019. Instead of presents she made a lovely gesture of asking for donations to Lupus UK. Family and friends gave generously and she has collected £312 altogether. My Auntie did this because I have Lupus SLE, as well as other health conditions. I have been very ill since 2008 and it was in 2015 that I was finally diagnosed with Lupus. 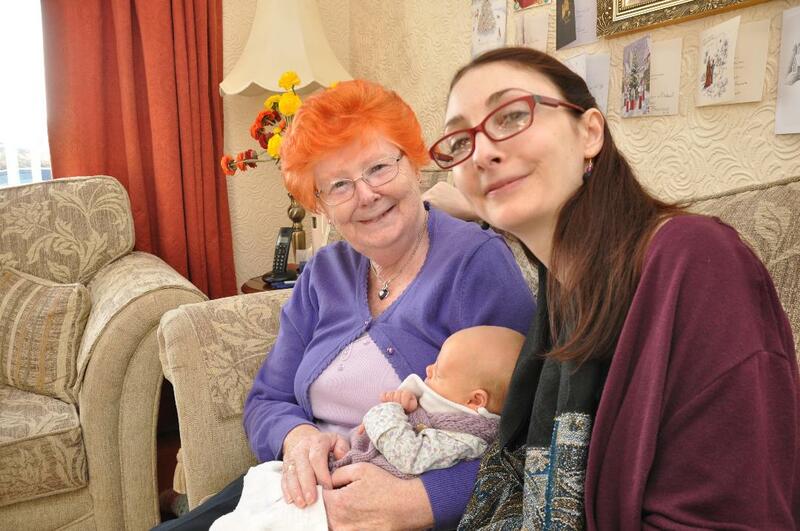 Finally knowing what the cause of my problems was and then getting the correct treatment has led to huge improvements in my health, so much so that in November 2018 I gave birth to a healthy baby, Sumaya ( pictured here with my auntie and myself). Being a member of Lupus UK and receiving the support they offer with information and the lupus nurses, as well as meetups when I'm well enough to attend, has been a great comfort to understand my condition and meet others suffering with similar issues. I'd just like to send the biggest thank you to my auntie for showing such loving support". Thank you Auntie Brenda from all at Lupus UK and congratulations to Vicki on the arrival of Daughter Sumaya. 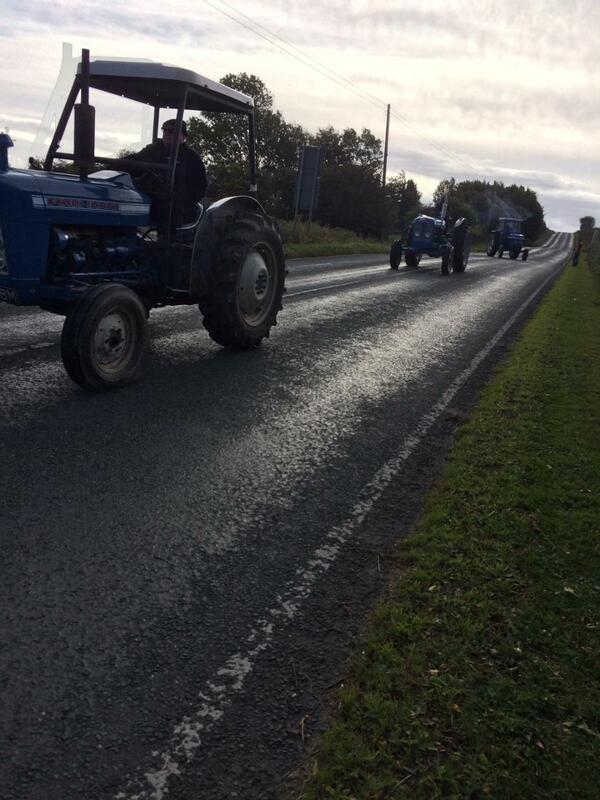 A Tractor run organised by the Flass Vale Vintage Tractor Club in Durham has raised a fantastic amount of £2726 for Lupus UK. The run set off from Ushaw College then took in Knitsley Hall, Satley and Butsfield with many off road sections courtesy of local farmers and landowners. The procession which included 75 entrants stopped for lunch at Hall Hill Farm before setting off for the return journey to Ushaw College where a hog roast was waiting. There was also a fundraising raffle and Tombola. 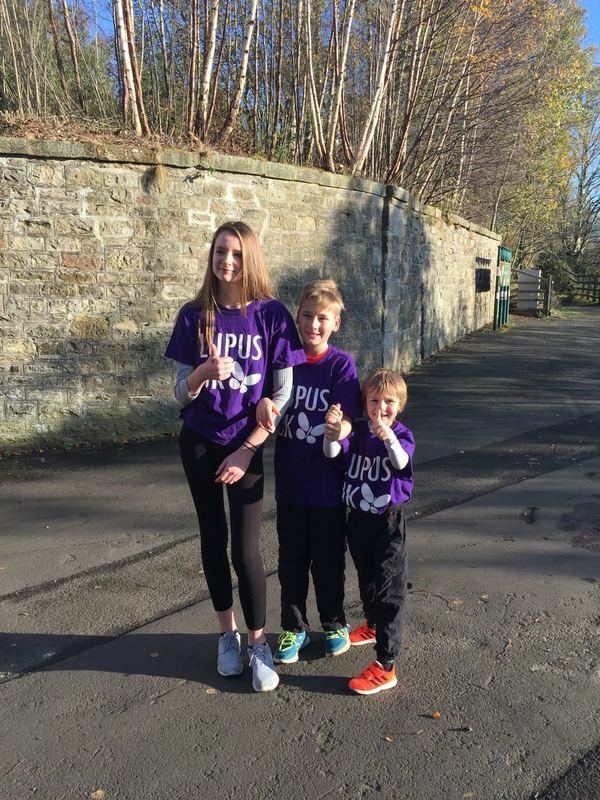 Every year the run raises money for local charities but this year, because a family member of one of the entrants has Lupus they decided to raise money for Lupus UK. Lucy Stephenson, daughter of club member Dickie Armstrong suffers from Lupus and was thrilled the club supported a charity close to her heart. ​Gisborough Hall meeting - Welcome 2019! Member Kevin Rooney has kindly provide an update from the meeting on Saturday 9th February 2019. On a beautiful sunny but rather windy day it was great to see 9 existing members and one new member together with 3 supporting family members in the elegant drawing room. Our new member Caroline give us all the full story of how she has gone from being a very active individual enjoying her spare time with horses and planning her wedding to being diagnosed with Lupus in December 2018. She was married in mid 2018 and the onset of Lupus symptoms starting to impact on both her social and work life. Following a period of hospitalisation she was very quickly diagnosed and she spoke in high regards of her treatment by the consultant and hospital staff. Many in the room were able through their own experience to provide both information and support to Caroline . Those existing members in the room were all able to provide updated information over the last few months and shared knowledge in relation to current drugs , usage, side effects and advice from Lupus trained staff. It was also thought it may be a good idea to consider setting up a WhatsApp group if this was of significant interest to those attending. It was agreed we would liaise and consider at the next meeting. Given the wide ranging topics discussed and the areas covered it was also thought it could be useful to look to get a visiting speaker for a future meeting to cover some of the areas raised. 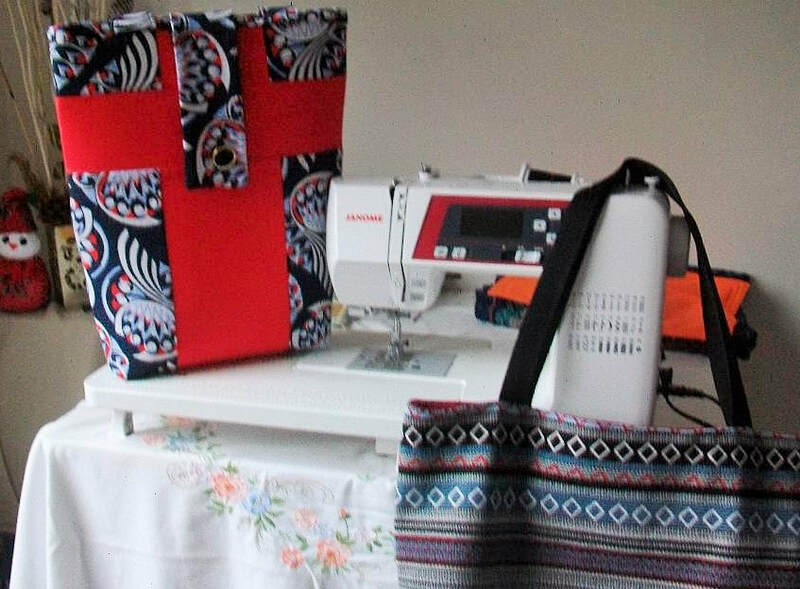 Linda continues her work with making and selling good quality bags with all proceeds going to Lupus UK and I hope she will have more at our next meeting. The date, time and location of the next meeting will be given on this website as soon as the venue and time is confirmed. We look forward to welcoming all existing sufferers together with any new sufferers who can relax in a convivial atmosphere. On Wednesday 5th December The Blaydon, Ryton & Whickham Rotary presented a Christmas Concert with The Grainger Singers at St Mary The Virgin Parish Church in Whickham in aid of Lupus UK and Whickham Community Centre. Alan Nicholson -Member of BRW Rotary stated; " Last nights Christmas Concert the two charities chosen as beneficiaries from the concert were Whickham Community Centre and Lupus UK. Rotary BRW President Geoff presented cheques to both charities for £500.00, in addition Lloyds Bank attended the concert and announced they were matching our donation which was fantastic news. 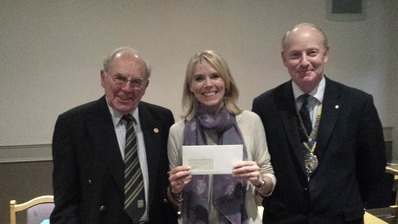 Julie Nicholson accepted the cheque on behalf of Lupus UK and gave a brilliant thank you to Rotary BRW and Lloyds Bank on behalf of Lupus UK explaining to the audience what Lupus was. We are naturally delighted the concert was a big success ensuring that Lupus UK will be receiving £1000.00"
Pictured below is Julie receiving a cheque from Geoff and Sally receiving a cheque from Alan. Linda Robinson has being diligently sewing for Lupus UK. She has sold her wonderful creations in aid of our charity and has pleased everyone with her bags, yoga cushions and other hand-made delights. She has made a whopping £120 and there is no sign of stopping her. Linda, from all of us, thank you! We received our usual warm welcome and a private room to meet in. 9 existing members were joined by one newbie, Alex, and 4 spouses/friends. We had a pleasant surprise to start the meeting. Mark Nicholson whose Sister In Law has Lupus had run the Great North Run in September and informed us he had raised £288 on-line for Lupus UK. Great effort and much appreciated by all. He then turned up on Saturday and produced a cheque for the other £950 he had also raised on our behalf (Mark pictured presenting cheque) . Well, nothing like having your spirits lifted with surprises like that. The round of applause that followed was just a token of our appreciation for their efforts. The next announcement was that Lupus UK were to be one of the beneficiaries of a Rotary Club Carol Concert to be held in the local Church. More details to be added to the website soon. Linda produced another fine collection of hand made bags for sale. These monies were to be added to the £90 she has already raised, and continues to raise through her crafting efforts; well done Linda. Susie told us about the crime novels that her Dad has written, with profits going to Lupus UK. If anyone is interested, his name is Frank Broughton and his 2 novels so far are Red Week and Black Hole. These are published on Amazon and are available in Kindle and hardback. Again, such kind efforts on our behalf. Sally discussed her stepping back from the role of regional coordinator as her work schedule is getting busier, and time to recuperate less. Susie has some experience of web sites and social media so offered to help take that on, with Lupus UK approval. Hopefully we can alleviate the pressure from Sally by dividing work between a few of us. New member Alex had only been diagnosed with SLE since 9th October, so was understandably worried about it all. We tried to allay some fears and hopes she continues to attend meetings. All in all a different meeting with lots of topics and surprises and discussions. Date and venue of the next meeting in February to be confirmed nearer the time. Update kindly provided by Judith Sutherland..
Saturday 18th August and once again we held our meeting at the impressive Gisborough Hall, set in the beautiful surroundings of the North York Moors. The private function room allowed us to chat in peace, drinking our teas and coffees and sampling the delights of home made shortbread. There were 7 Lupus sufferers and 2 suffering spouses. We were especially delighted to have member Maureen and husband John back with us following their horrific motorcycle crash earlier this year. Both are much improved but the scars and the photographs bore testament to their injuries. Getting around is difficult as both are reliant on crutches and sticks. We wish them well and continued improvement. We also had member Margaret and husband Andy join us. Andy used to run the North East group before retiring and Sally taking over. Lovely to see them again; not so nice to hear of their 'latest' health issues and trials and tribulations with the health service. Sally informed us that she has sent almost £1300 to Lupus UK following the Fun Day at the Bay Horse Whickham. A good result for a few hours enjoyment/work. The Wooler Walkers continue their amazing fun raising efforts and have raised a good amount so far this year. Well done and a big Thank You. On a very hot Sunday 5th August, 44 walkers braved the temperatures in Wooler and raised an amazing amount of £2727 for Lupus UK. Organiser Helen Carr states they had a great day and fun filled night at The Angel Inn. Thanks again Helen and team. 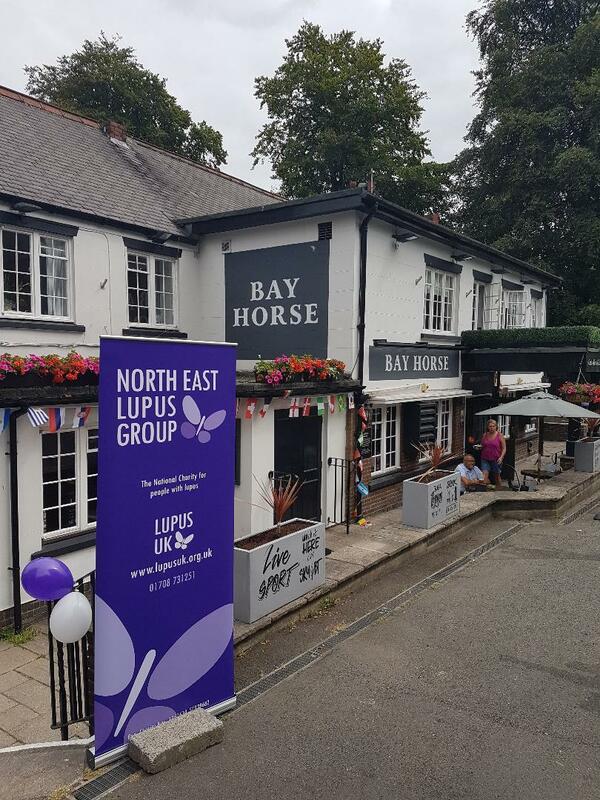 On Sunday 8th July 2018, staff at The Bay Horse, Front Street, Whickham held a Fun day in support of Lupus UK. Our North East Group provided a cake stall, homemade bags, gifts and jewellery. We also provided information on Lupus aided by flags, badges and wristbands. There was a fantastic turnout and the weather didn't disappoint! Children (and adults) enjoyed hook a duck, candy floss and much more. Brave volunteers, my Son being one got a good soaking in the stocks! Thank you so much to Cheryl, Dionne, Julie, Paul and Alan from The Bay Horse for arranging the day and supporting Lupus UK. A grand total of £1,391.78 was raised!! A special mention must go to Ray Feenan who donated £100 to Lupus UK on the day in memory of his Wife Margaret who sadly passed away from Lupus. A big thank you also to Judith, Linda, Kevin and his Wife, and Daryl and Christine from our North East Group who came along to help and support. Our meeting on Saturday 12th May at The Bay Horse, Whickham, was a great success (We even had royalty visit!). Thank you to Dionne and Staff for accommodating us. Judith Sutherland has one again kindly provided an update..
Saturday 12th May and our meeting this time was held courtesy of the Bay Horse, Whickham. We had a function room all to ourselves which was great; everyone could both see and hear anyone who was speaking. A combination of being local, and the good weather saw a turnout of 13 members plus family supporters. Introducing ourselves in turn, we each had the chance to say what ailed us (SLE, DLE, Sjogrens, Hughes, Mycena Gravis, lungs, liver, kidney, spleen, eyes, heart, muscles, joints, fatigue, skin, hair loss, miscarriages...) covering quite a bit of the medical dictionary. As usual, amazing how we are all affected so differently. To all our members who couldn't make it today, we hope to see you again soon. A special mention goes out to our member Maureen and husband John who have been involved in a nasty motorcycle accident. A car pulled out in front of them, the result being that both have broken bones in their legs - as if life wasn't difficult enough. We wish you a speedy recovery and hope the bike is ok! On the wonderful sunny morning of Saturday 5th May 2018, Markfield Methodist Chapel was the venue for a Lupus fundraising event. The morning was arranged by my amazing parents, Linda and William Walmsley and with help from their ever supportive friends a brilliant amount of £276.50 was raised! Mum spent many hours baking delicious cakes which went down a treat along with sales of plants and a raffle. As you can see from the photos there was a great turnout. Thank you to all involved and for supporting Lupus UK. Linda Robinson continues to be our fundraising hero. In her words "Bit by bit since before Christmas I have raised £100 with the sale of bags, cushions and Christmas decorations". The items are all handmade by Linda and I'm sure you'll agree she is doing a terrific job. Well done! Thank you BRW Rotary Club! ​On Friday 2nd February 2018 I attended The Bay Horse in Whickham and met Alan, Kev and Ron representing Blaydon, Ryton and Whickham Rotary Club. I was told prior to my arrival that they had something for me but I didn't know what. As I sat waiting for them with my very nice latte I felt like I was part of some dodgy deal which they found highly amusing. I had met Alan and Ron in October 2017 (see below) when I attended a Rotary Club evening to discuss Lupus with members. It was lovely to see them again and meet Kevin (Ex President) for the first time. The current President Paul was busy with work and couldn't make it so Kev kindly attended on his behalf. They gave me the great surprise of presenting me with a cheque for £250 for Lupus UK. I was thrilled and thanked them for their amazing generosity on behalf of The North East Group and Lupus UK. To top the morning off even more I spoke to Dionne, The Landlady who said our North East Lupus Group is more than welcome to meet at The Bay Horse for our Bi-Monthly get togethers. Hopefully it will be a new popular central location. Watch this space for the April meeting. ​Following on from the above news, Alan's Son Marc is running in the Great North Run this September for Lupus UK. He has knowledge of the disease due his Sister in law Julie having Lupus. Please support Marc by visiting his page on www.Justgiving.com- Marc Nicholson. I recently received this moving email from Pauline Moger..
"I’m dropping a line in my role of secretary of Belmont Ladies Choir. As a local Durham Choir we hold concerts on request and generate our own. One of our Christmas Concerts is in partnership with Pittington Brass and this year it will be held Thursday 14th December, St Cuthbert’s Church, Durham (North Road). Sadly just last week we lost one of our very dear members and former Secretary who had suffered from and lived with Lupus for many years. We are dedicating our Christmas Concert to Susan. This year we want to give our donation to Lupus in memory of Susan". I attended the Concert with my Sister and we thoroughly enjoyed ourselves. The Choir (and audience) sang their hearts out and the Brass Band was rousing! Mince pies and cuppas went down a treat at the interval and I had the pleasure of meeting and thanking Pauline for their efforts. They certainly did Susan proud and I'm sure her family would have felt comforted by the heart warming event. Going that extra mile in Haltwhistle! Well done Elena, Reed and Seth who didn't walk but ran an extra mile raising a wonderful £90 on behalf of their Granny, Ann Bryson. ​Ann recently raised £100 for Lupus UK by hosting a coffee morning at St Paul's Church, Winlaton on 10th September. I'm sure you'll agree what a great family effort. Linda and Maureen deep in conversation. A fine display of Lindas homemade crafts raising money for Lupus UK. ​Autumn meeting at St Margaret's Church hall, Brookfield on Saturday 11th November. The meeting today saw us travelling to St Margaret's Church Hall Middlesbrough as we are no longer welcome at the Ramside. On this lovely sunny day we had a quiet but enjoyable meeting in a room of our own, free to drink as much tea and coffee as we wished - 2 cups all round. There were 6 members and Maureen's husband John also. Sally read out an email from Christine. As the meeting was right on her doorstep for a change, she was sorry not to attend but had very recently come home from hospital and was slowly recovering from the pneumonia she contracted whilst in there. Best wishes for a speedy recovery. Member Vicki also sent Sally an email apologising for not being well enough to attend. No apology needed Vicki and we all send our love and best wishes. Maureen was our quietest member today as she lost her voice following surgery 4 weeks ago. She also developed pneumonia whilst in hospital - says a lot for trying to stay out of these places. Amongst the topics discussed were the benefits of counselling in order to cope better and utilise time and effort more efficiently. Also changing roles at work (where possible) in order to cope physically and continue in current employment fields. Managing fatigue following outings and events was high on most peoples agendas. It is difficult to judge whether the change of venue had a great impact on the attendance numbers. Those who did attend contributed to the cost of the room so Sally was not out of pocket on our behalf. It was agreed that we keep looking for alternative venues and possibly vary where we hold the meetings to give everyone a chance to have them held nearer to home. Whilst the Ramside Hotel ticked most boxes, accessibility location parking etc, none of us has come up with a viable option yet, although we all agreed that we would love to take up the offer to meet at Guisborough Hall, but perhaps not in February in case the weather is bad. Sally is going to check out a pub that may welcome us. If anyone has any ideas, please let Sally know. We look forward to seeing you all at our next meeting in February. Date to be confirmed nearer the time. Wishing all of you a Merry Christmas and Happy Healthy New Year. On Thursday 19th October, I had the pleasure of attending The Bay Horse in Whickham after an invite by Alan Nicholson, a member of The Rotary Club of Blaydon, Ryton and Whickham. Me and Husband Gav were given a really warm welcome by all the members and I was able to give them an input about Lupus. Some there already knew a little about Lupus because Julie Nicholson, Wife of President Paul has suffered with the disease for 26 years! It was lovely to meet Julie although unfortunately she is not well at all. Lupus has attacked most of her organs and continues to do so. She had the most amazing smile on her face even though she is on a cocktail of medication. We wish her all the best for the future and hope to see her at the next North East group meeting. Thank you to everybody for the invite and warm welcome. Well done to Kev Craig who ran...and I mean ran the Great North Run to raise money for Lupus UK. He completed the course in an amazing time and we thank him for his superb effort. His picture certainly deserves a caption..answers on a postcard! ​Sunday 6th August, 2017 saw the Wooler walkers embark on their annual outing for Lupus UK. Organiser Helen Carr stated..
"Once again we had good day yesterday. 47 walkers doing 10 miles across hill, ending the night with supper and great live music on the Angel Inn". They never cease to amaze and Helen will report back with the amount raised when it's all collected. Well done and Thank you!! Well done Linda Robinson! Linda has recently raised £160 for Lupus UK by doing a couple of car boots sales and selling a few more of her lovely handmade bags. Thank you so much on behalf of us all... your enthusiasm never fails to impress! ​The morning of Saturday 13th May, 2017 saw my Mum and Dad (aka my heroes!) hold a Lupus coffee morning at Markfield Methodist Church. It is in Leicestershire so apologies to the East Midlands Group for "stealing" this one but as we all know the proceeds will be going to the same great Lupus UK charity. A good turn out enjoyed toasted tea cakes and biscuits washed down with tea or coffee and free refills!! Thank you to all who contributed and a special thanks to the gang...Ann, Ian, Hilda and Dave for their ongoing support and being there for Mum and Dad. Teacakes went down a treat! ​On Thursday 11th May, 2017, I attended Sunderland College (Bede Building) to talk to students about Lupus. I was invited by Ian Crowe whose Mum has Lupus and is having a really rough time with the disease. Ian is studying Media at the College and embraced the opportunity to spread the Lupus word when he was asked to contribute to an event called "The people's pages". This involved contacting people who were prepared to attend the College to discuss their personal topic with students and receive feedback. I learnt – what lupus is, that it needs research - even though you suffer from a disease you can continue to work in a job you love. How difficult it can be to come to terms with the condition and that it can be frustrating when other people don’t know much about it. I was surprised by how poorly you can be if you have Lupus. Overall Sally was really cool – I would have loved to hear more - it was great to hear her story. Thank you Ian and Gilly for inviting me on behalf of Lupus UK. £15,350 raised by Just giving page! Clare Langley and Laura Young successfully completed the New York Marathon on 6th November and have since held quiz nights and raffles. In total they have raised the amazing amount of £15,350 for Lupus UK and Cancer research. The page is now closed and I'm sure you'll agree this was a fantastic effort and lots of hard work. Well done and thank you so much to both of you!! On November 25th, 2016, member Linda Robinson collected a cheque on behalf of Lupus UK for £200 which had kindly been raised by members of Stockton on Tees Masonic Hall. The gentleman presenting the cheque to Linda is Ian Crowle, the master of the Stockton on Tees Masonic Lodge 9667. Thank you so much for your fundraising efforts and choosing Lupus UK as a charity to support! 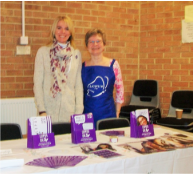 ​On Saturday 22nd October 2016, a Coffee morning for Lupus UK awareness month was held in St Margaret's Church hall, Brookfield,Middlesborough. There was a great turnout and the fantastic amount of £500 was raised. 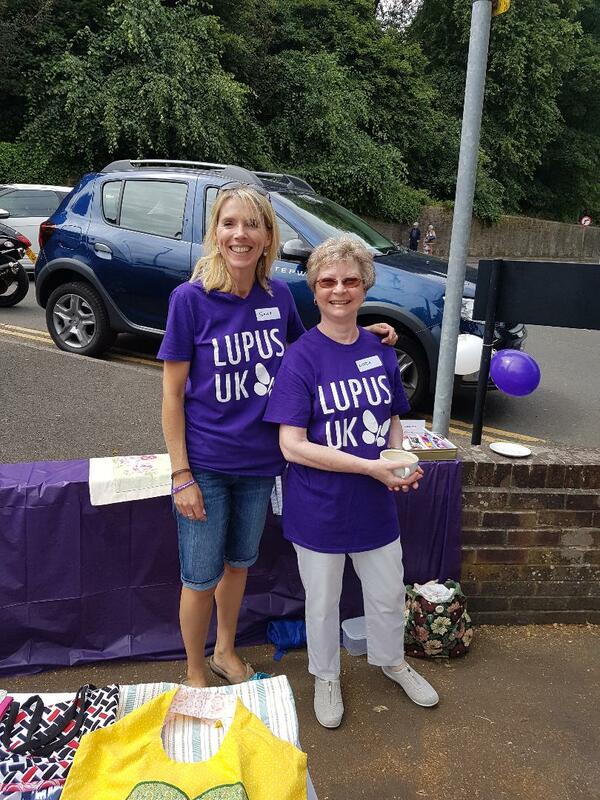 Lupus UK member Linda Robinson organised the event which was a tremendous success. Several stalls selling books, CD's, cakes and Linda's homemade bags proved popular. Alongside a tombola and a raffle prize selection was a very important table displaying Lupus information. Thank you Linda for all your hard work. Special mentions and thanks to Maureen and John for their tea and coffee making skills and to Judith for her fine vocals with the raffle draw. Bob Rennison, a rotary member invited me along to say a few words. Bob knows about Lupus as his daughter, Kay has been diagnosed with it for 30 years. I explained just how much it means to be a chosen charity of theirs, not only for the fundraising but how much it raises awareness of the disease within the community. ​Thank you so much for your hard work and please stay in touch. Pictured with me, on the left is Bob and on the right is the President of the Club, Stephen Lightley.